By LUDWIG VON KOOPA - But I have an idea in here anyway in case anyone wants it. One large shame about the videogame industry is that the time between idea conception and product realization is very long. It's the longest of any creative medium. Compare it to, say, KoopaTV. KoopaTV can take any hot-button issue and have an article out that day. The videogame industry has to wait years before that realization. That could be months, but then it probably won't end up very good. An exception is Trayvon Tyson's Punch-Out! !, critically acclaimed by everyone who has actually played it. Take Ebola, for example. Ebola is something that is on everyone's mind right now. After all, it's a very scary virus that melts your insides that has a very high death rate and no known cure, and it's being imported to the United States from Africa because President Barack Hussein Obama refuses to issue a travel ban. If a videogame based on Ebola came out now, imagine the demand! Everyone in the world has (or wants to have) a connection to Ebola. It'd be an instant classic. Unfortunately (for profit), Ebola will likely be eradicated from civilization in six months. Certainly less than a year. You can't make a good survival horror that would please the likes of Feriku in that short time frame while the demand is still high. Not even an action horror! The upside is that while videogames take the longest to make, people enter the industry because the profit potential is the highest of any creative medium. I don't have stats to back that up, but that's conventional wisdom! Videogames are the most complicated creative medium. It has audio, video, text, and interactivity. It has the most resources going into it, so therefore it has the greatest potential pay-off. But again, that means that you can't capitalize on pop culture fads. You have to predict them well in advance, and if you're doing that successfully, you should be in financial trading, not the videogame industry. Or you could recycle old games that happen to fit and re-release them. Still, I (and RawkHawk2010... just a little bit) came up with my own Ebola idea. And I'm going to make it public domain. So feel free to use it, Nintendo! Everything between the red lines I am not making my property or KoopaTV's property. No royalty necessary! 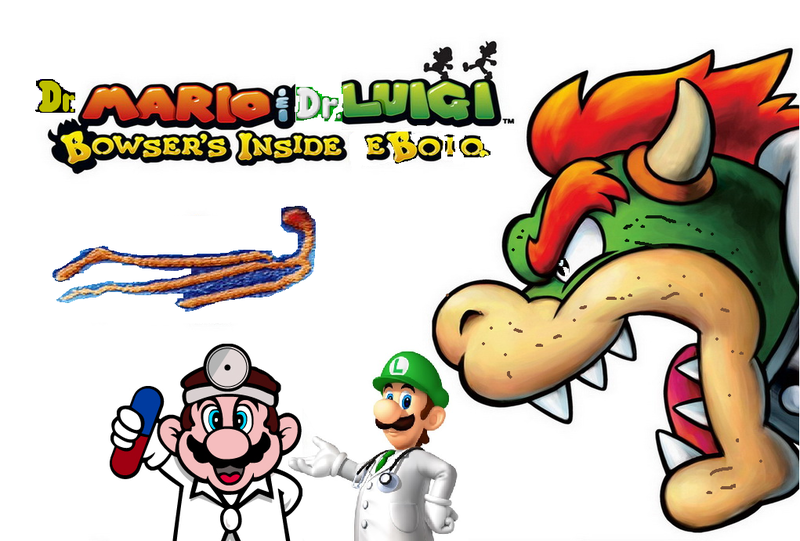 "Dr. Mario & Dr. Luigi: Bowser's Inside Ebola"! When I said Nintendo, that also includes AlphaDream. The next game in the Mario & Luigi series will be a sequel to Mario & Luigi: Bowser's Inside Story, and will be a turn-based roleplaying game with strategy elements. In "Dr. Mario & Dr. Luigi: Bowser's Inside Ebola" for the Nintendo 3DS (or DM&DL:BIE for short, pronounced 'Dimdillbye'), Bowser gets sick with Ebola after visiting the United States of America to see President Barack Hussein Obama following Obama's Bowser endorsement. It was all a trap to sicken Bowser. Since King Dad is a visiting national and not a United States citizen, he does not have United States health insurance. He has to sign up on the ObamaCare federal exchange, because he cannot return to Koopa Kingdom. Koopa Kingdom has no way of treating Ebola, unfortunately. So under ObamaCare, Bowser's choice of doctors is heavily reduced from what it could otherwise be, because doctors are leaving the field in droves thanks to ObamaCare. All that is left is the local family practice of Dr. Mario and Dr. Luigi, who still happen to be around the area. You play as Dr. Mario and Dr. Luigi as you travel inside King Bowser's body to rid him of Ebola. Only one doctor can be inside his body at a time, as the other brother is on the operating table. Control the operating table doctor on the top screen using your buttons, and the bottom screen doctor with Touch Screen controls as you coordinate to stop Bowser's insides from melting. One doctor will use traditional tools of the trade (including Multivitamins) and orient Bowser around the operating table to assist overworld movement, solve puzzles, and help in-game play. The other doctor will use traditional Mario & Luigi moves in battle and in the overworld map. It turns out that this is no ordinary strain of Ebola, however. If regular Ebola was not enough, this strain is actually a bio-weapon monster named Chuckola Bola (harvested from the Chuckola fruit from Chateau de Chucklehuck from Mario & Luigi: Superstar Saga). Chuckola Bola has taken residence throughout Bowser's body and has sent his minions to each section. Dr. Mario and Dr. Luigi will have to coordinate their efforts to purify each part while also preventing previously cleared parts from being recaptured in an epic and amazing story. Oh, and funny, in traditional Mario & Luigi fashion. Astute gamers may point out that this combines features from both Bowser's Inside Story and Dream Team. One part is missing: You don't play as Bowser in the overworld! Can King Bowser foil Chuckola Bola and get revenge on Barack Obama? Can Dr. Mario and Dr. Luigi cure Bowser? Do they even want to? Will they be able to leave the United States of America? Ludwig would play the game idea he provided above. He has also made a lot of other game ideas that are NOT for public use and are on the KoopaTV Intranet. One company DID take advantage of this opportunism, on the topic of North Korea. Bowser, Ludwig, and other members of the Koopa family may finally have a dangerous widespread disease. ...I know, I should be laughing about Chuckola Bola, and instead I went into full-fledged Resident Evil nerd mode. So RE's inspiration was a virus from the 1970s that wasn't reaaallly that significant at the time? Well, guess we better see big Resident Evil collections being announced now. The CDC guy's logic is nonexistent. Closing our borders would drastically reduce the availability of imported Ebola in the USA. Anyway, the other African nations have already closed their borders! I don't think it was the inspiration, just written into the backstory whenever Wesker's Report II was released. It makes sense, when you think about it. Umbrella was researching a very deadly virus in Africa. I think the CDC's concern is that people would panic, and start sneaking, and then you'd have people with Ebola HIDING. But they (and lots of countries) should have been doing more to help months ago. But Africa gets very deadly viruses all the time, right? Who would panic? The Africans? Sneaking into the country across an ocean sounds a lot harder to do than just being let in. Well, that's the one Capcom thought was the most interesting, I guess. XDD The problem would be people going to another country, then getting fake passports or something to sneak in like that. So you would potentially have infected people whose real travel history you don't know, versus knowing where they're from because they didn't sneak. Basic logic says that there will be less of them in America if we close off #1. Not everyone can do #2!